It takes money to make money. This old adage certainly holds true for businesses that process cash transactions. Cash costs U.S. businesses $55 billion yearly. While most of that is due to theft, the figure also includes time spent on processing, counting and transporting bills and coins. Some cash-related costs are inevitable, technology can substantially reduce those expenses. Intelligent cash drawers integrated with POS systems save businesses substantial amounts of money through automatic reconciliation. That means no more manual cash counts. Instead, you get reliable, accurate data on the cash sums contained in tills at all times. 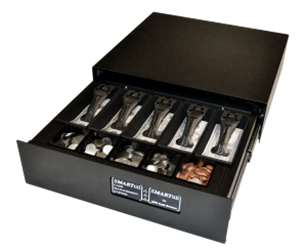 The SMARTtill™ Cash Management Solution delivers quick ROI and reduces cash losses by up to 90%.